Chronic Fatigue Syndrome (CFS) is of growing concern in the few last decades. The cost of this condition is in the billions. From lost productivity to miserable quality of life, this condition can cripple an individual and their family. More and more Americans are reporting to doctors with fatigue ranging from “being a slow starter” to “complete exhaustion”. Chronic fatigue can affect both men and women at any age. There may be certain life events that can trigger CFS such as extreme stress, a virus or hormonal imbalances. What leads to Chronic Fatigue Syndrome? Fatigue affects all of us from time to time; if we don’t get enough sleep or have jet lag we expect to be tired. Chronic fatigue on the other hand, is not alleviated by sleeping in or resting more. Those suffering with CFS have often tried everything you can imagine to improve their energy. Although the root cause can vary from patient to patient, there are many similarities. The battle is not only exhausting but the diagnostic tools that are used by most doctors fail to address the root cause the of the problem, mitochondropathy. Guess what? Mitochondropathy is not even tested in 99.99% of doctor offices. Often, patients are left to their own devices, prescribed depression medications or told that they are crazy! Sound familiar? Energy cannot be created or destroyed, it can only change forms. Energy in this case, is extracted from our food and then turned into a usable form known as ATP. The energy that comes from our food is measured in calories but the body must convert it to ATP to use it. 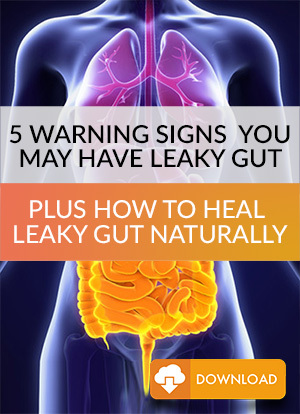 Food is digested and absorbed by the gut. Through the coordination of several glands and hormones, fats, carbohydrates, and proteins enter into tiny little engines inside our cells called mitochondria. You literally have trillions of mitochondria in your body. This is the very foundation of energy production for the human body. Think of the food you eat like filling up your gas tank. Gasoline (food) is useless unless you have spark plugs (nutrients) that work. Each depends on the other for normal function. In the absence of adequate nutrients, the mitochondria (engine) begins to fail. This is known as mitochondropathy. The result is persistent fatigue that is caused by a failure at a cellular level. This dysfunction affects virtually every cell and system in your body, leading to widespread symptoms. Through a specific urine test, mitochondrial function can be evaluated. Below are the results from an actual patient at our office. This patient presented to us with extreme exhaustion and was prescribed higher and higher doses of thyroid hormone medication because her primary doctor failed to order the right testing! Imagine her frustration when she realized that she had been misdiagnosed and mistreated for almost 15 years! When your doctor orders the right testing the problem becomes so obvious. Unfortunately, most doctors are not trained to order and interpret this advanced testing that evaluates mitochondropathy and connect it with Chronic Fatigue Syndrome. 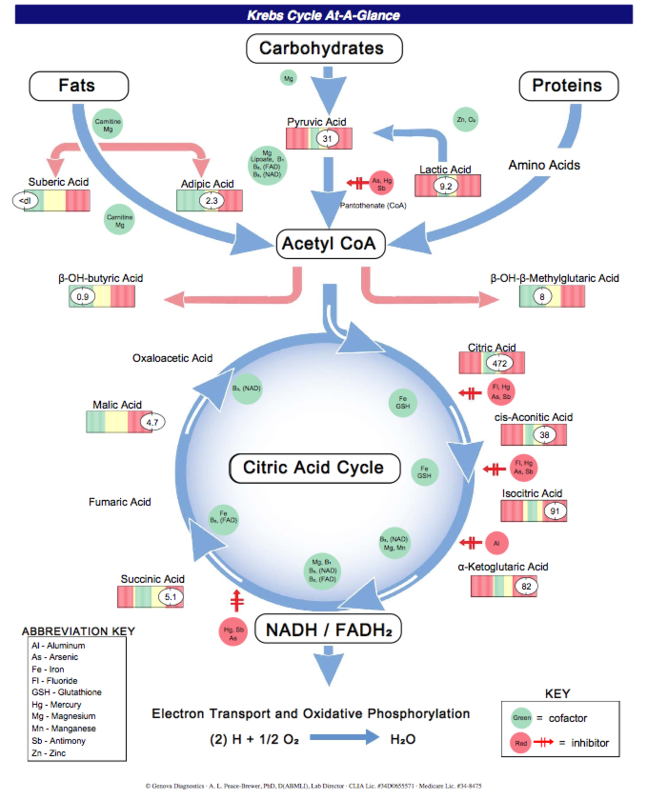 The image above is an illustration of the Citric Acid Cycle/Kreb’s Cycle. You should note that the nutrients listed in green represent co-factors (spark plugs) that help drive the reaction forward. These nutrients include B1, B2, B3, Lipoic Acid, Iron, Magnesium and specific amino acids. The markers listed in red, slow down or inhibit the process. These include heavy metals like Mercury, Arsenic, Fluoride, and Aluminum. 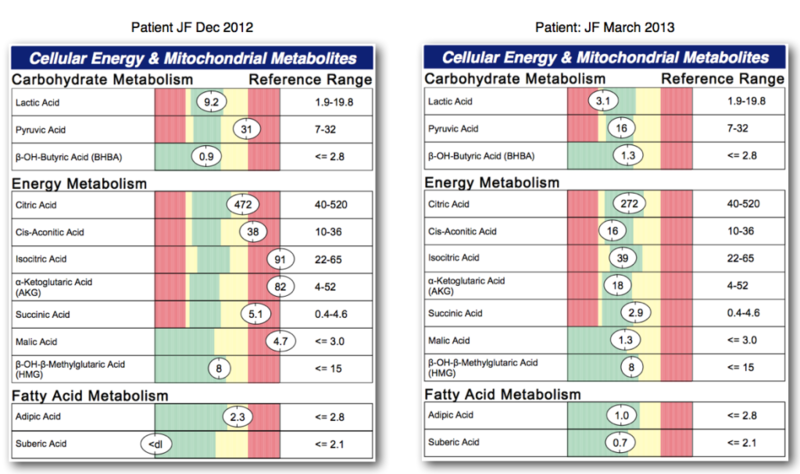 This evaluation gives us profound insight into what is happening at a cellular level inside your mitochondria. When a specific step is not occurring fast enough the markers next to each step will accumulate. These markers are then excreted in the urine, where they can be measured, as seen below. Once evaluated, a detailed action plan can be created to correct the imbalance in the mitochondria. The markers in red are abnormal, green is normal. This treatment includes diet, lifestyle, specific supplements and of course; time. Remember you have trillions of cells performing this function. The above images are the before and after of the patient mentioned above. In less than three months she was able to resolve her chronic fatigue and enjoy her life once again. 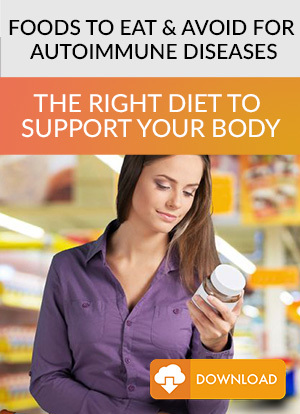 Food sensitivities such as gluten/grains, dairy, eggs, lectins, etc.